Heroes gather on the east coast. 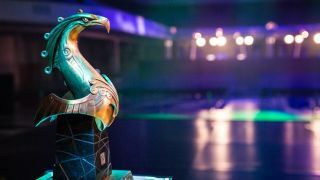 It’s December, and although the pro Dota scene has been steadily recovering from the post-International hiatus, the rust still hasn’t quite come off. Now, just as your pub games are starting to go stale, the light is about to burst out from behind the clouds. Ladies and gentlemen, the Boston Major is almost upon us. Here’s what you need to know about the competitors. Key Heroes: Go into a Wings draft expecting the unexpected. If you asked me who Wings Gaming were this time last year, my answer would have been ‘I think I’ve heard of them’. Since then the Chinese team have become powerhouses and the winners of this year’s International. International Winners in the past have almost always been pretty terrible in the months after the tournament ends, but not Wings. They’ll be charging into the Boston Major with wins at the Nanyang Championships and the Northern BEAT Arena under their belt. Their strengths lie in their drafts and the sheer amount of trust the players have in each other. Expect mad picks, mad low percentage plays and a 'go hard or go home' style of Dota. They are very capable of winning the Boston Major. Digital Chaos gave us one of the greatest stories in pro Dota 2 ever. This band of rejects put together a monumental TI run this year which saw them finish the tournament in second place. They draft unpredictably and play unpredictably too, making them a nightmare to come up against. Captain Misery is a veteran of the scene, and despite not even wanting to take up captaincy, he’s proved himself to be one of the best. Add to that explosive young core players w33haa and Resolut1on, erratic offlaner MoonMeander and stable support Saksa and you've got a recipe for success. After such a great year, offlaner MoonMeander was surprisingly kicked from OG and picked up by DC. This has definitely sparked a rivalry between OG and Moon, who will be looking to get his own back for what he’ll consider an undeserved dismissal. OG are the team that I thought were going to win TI6. Cohesion issues within OG appeared to hamper their form at The International, which saw them place a lot lower than people were expecting. That’s in the past, however, and OG are back with a new team. Best buds n0tail and Fly have put together another strong looking Dota 2 squad, losing Cr1t, Miracle and MoonMeadner while picking up Jerax, s4 and relatively unknown midlaner Ana. Their philosophy remains unchanged from last year. It’s the same brand of Dota, just with different pieces—expect exemplary team fight coordination and a mid laner that can completely take over a game. OG could well make up for their poor TI showing, following their second place finish at the Summit. After finishing in third place at the International and winning it the previous year, you wouldn't expect the EG line-up to have changed much since TI6. Two players have been swapped out, however, and while that doesn't seem like many, those two were EG's soul. Captain PPD was replaced by Cr1t, who left OG in search of greener pastures, and Mr EG himself old man Fear was replaced by Arteezy (yes, this is his third time joining EG). Winning one LAN and placing third in another, they’re certainly in good stead for the upcoming major. EG and NP have been building up a rivalry over the past few weeks which we could see develop further in Boston. Newbee are looking very different to the team that attended TI6. They have three new faces, two of whom I'd never heard of before they joined the squad. I think Newbee have the potential to surprise at this event. Both Sccc and uuu9 rank at around the 9k MMR mark, which is nothing to be scoffed at. If they've used their two months away from competitive Dota improving their teamwork, they could do well. Also joining the team is Faith, who won TI2 all those years ago with IG. Having a TI winner in your squad can't hurt. Right? EHOME are a mixture of scene veterans and a few newcomers. LaNm, who started his Dota 2 career there way back when, and old chicken, who has played for EHOME for his year or so in Dota 2. They lost iceiceice after TI6 and replaced him with well known carry player Sylar. EHOME always seem to get the title of 'outside favourites' as everyone that knows they can do extremely well in any tournament they're part of. A major issue for them is consistency, especially at Valve hosted events. Winning a load of the smaller competitions is nice and all, but we all know what the real aim is. I don’t think EHOME will win, but you don’t get labeled ‘outside favourites’ at almost every single tournament you attend for no reason. MVP Phoenix play Dota the way you wish you could play Dota. I don't think MVP are actually capable of playing in a conventional way. They just run at you! I don't really know what else to say. It's so simple, but also so incredibly entertaining to watch. It doesn't matter where they are, they will kill you. Underneath tier four towers, doesn't matter, surrounded by the rest of your team, doesn't matter—I think the only place on the map off limits for MVP is the enemy fountain, and even that's debatable. When they get it right it's unbelievable to watch and they can definitely beat anyone. With Forev recently rejoining after a short, unsuccessful stint with Team Secret, their chances at the Major have definitely gone up. Team NP were born out of the ashes of the North American scene. EternaLEnVy and Aui_2000, two very established and successful players, created the team in the September after TI6. At the start no one gave Envy and his rag-tag band of North American rejects much of a chance, but oh how they have proved everyone wrong. They stormed their way through the Boston Major US qualifiers, through the Summit 6 qualifiers and through the ESL One qualifiers (beating Complexity each time). They've placed well in every LAN they've attended. Their extremely efficient farming, good team communication and occasional hilarious misplays all make for entertaining Dota. Complexity Gaming, or coL, got through to the wildcards of 2016's International, but ended up going out to Execration when they stupidly allowed Meepo through the pool: a Meepo played by a guy with a competitive win rate on the hero of over 90%. Since then coL are looking a little different. Gone are Swedes Chessie, Limmp and Handsken, in their places are mid laner canceL^^, monkeys-forever offlane and Moo, who has taken up the role of carry. Moo feels he was unfairly kicked from Digital Chaos, and absolutely has a point to prove against his old team. Oh yeah, and Swindlemelonzz had dropped the 'Swindle' part of his name. He's just melonzz now, dunno why. Just really likes fruit I guess. LGD.Forever Young are a sort of spin off from LGD Gaming. The team was formed by Dota 2 veterans xiao8 and Yao after TI6. They won the Chinese qualifiers for the Boston Major, and did so in style, not dropping a single game in the playoffs. Because of visa issues, support player lpc and exciting young carry player Monet won’t be able to play in the major. Instead LGD.Forever Young will be replacing them with ddc and END of Vici Gaming. Two players, who could very well improve LGD.FY with the amount of big tournament experience they have. They know what it takes to win at an event like this one. Another Chinese spin off team—they really seem to love them. iG Vitality are, as their name suggests, a pretty young Dota team. They're made up of a number of Chinese players who were on the fringes of competitive Dota. They'll come into the Boston Major with a point to prove. After finishing second in a Chinese qualifier bracket that included big teams like LGD Gaming, Vici Gaming and CDEC, they have potential. Young, relatively unknown Chinese teams have shown us in the past they can be a force to be reckoned with (see also: Wings) so keep an eye on this lot. Due to visa issues, both captain super and support player dogf1ghts are unable to attend the Boston Major and will be replaced by Burning and Q from the main iG squad. I'm a big fan of Ad Finem. They're a team from Greece that formed mid 2015 and have stuck together ever since. They aren't the greatest Dota 2 team in the world, but they have played at a lot of major LAN events where they have done respectably well. They are always super entertaining to watch. In the tournaments where they've been up against the larger teams, they've always ended up somewhere in the middle of the pack. What's great about watching Ad Finem is the symbiotic relationship between their players. They always seem to know what each other are thinking, which in a game like Dota is incredibly important. I don't think they'll win the Major, but they're a team that can certainly cause upsets along the way. As the only CIS team at the Boston Major, the expectations of an entire region rest on Virtus Pro's shoulders. But these are very strong shoulders. Virtus Pro finished second in the European qualifiers to Ad Finem. They struggled in their first playoff series vs Liquid and dropped down to the losers bracket, but managed to turned it around and qualified for the Major. VP look unstoppable at the moment. They’ve recently won The Summit 6, pretty much without any competition, destroying OG 3-0 in a best out of five final. And in the same tournament they actually beat Wings 2-0, and you don't just beat Wings. Especially not two games to none. They are an embodiment of CIS-style Dota, playing aggressively in the early game, choking enemy teams out using heroes like Chen and Enchantress perfectly. I wouldn't be surprised at all to see Virtus Pro win the Major. After an average performance at TI6 with EHOME, offlaner iceiceice decided to part ways with the organisation and move back to his home country Singapore. He formed Team Faceless during that time, and they have been dominating the South East Asia region since. They’ve finished first in four tournament qualifiers since they formed, including the SEA qualifiers for the Boston Major. Iceiceice and his team have been establishing themselves as top dogs in that part of the globe. Iceiceice and mid laner Jabz bring bucket loads of flair to the team, which is music to the ears of German carry player Black^. He gladly uses the space those two provide him to farm more efficiently than almost any other pro player. They've proved themselves in South East Asia, so how about the world? A professional team from Malaysia, WarriorsGaming finished second in the SEA region's Boston Major qualifiers. Like Faceless, they have been doing really well within their own region. The Boston Major is now giving them a chance to prove their worth on an international stage. Their players won't be used to playing Dota in other regions and playing against the different styles and challenges each team poses. This could work in their favour though. A small, fairly unknown SEA team coming to a Valve event and wiping the floor with a bigger, unprepared team—sound familiar? Think TNC vs OG at this year's International. Core players Ahjit and NaNa are capable of flashy plays and carrying games when they need to, but can they do it on the big stage? Lucky, lucky LGD. They didn't originally qualify, finishing third in the Chinese qualifiers. Now, due to Execration's visa issues they've been chosen to replace them at the Boston Major. They seem to be the best choice. Captain Maybe led LGD through the round robin stage of qualification with only one loss in nine games. They then lost 2-1 to iG Vitality in the lower bracket final. The new look team includes Xz, a player who finished second with CDEC at TI5, Maybe, an incredibly talented midlaner who has always been the team's real playmaker, and three younger players who have been promoted up from various youth squads.